Tracey Midgley once more gave the fairy godmother touch to 18 bedrooms completely refurbished along with the installation of free wi fi internet access to all rooms and a new digital TV system. 20th Anniversary of the Landlubbers cruise – New ports of call, menus and a host of new entertainment acts made this the most successful cruise season ever – here’s to the Quarter Century !! A year of big birthdays – Martine Thomas celebrated her 21st – Neil Harrison our Head Chef celebrated his 50th and Christine Nurse Room assistant celebrated her 60th. Nathan Midgley takes the plunge ! 14000ft sky dive raising £2000 to help re generate a playground which will benefit around 70 local children. Tynedale awards 2012 – Top 6 finalist in the National Coach tourism Awards category. (Independent accommodation provider of the Year). 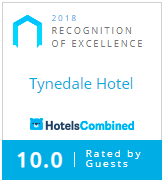 Trip advisor travel choice award 17th in the UK. 5 Star scores on the doors Hygiene award. Graduations – Claire Jones receptionist achieved a BA Hons degree in hospitality management and Martine Thomas achieved a degree in History. Off to University – Stacey Smith waitress moves to Liverpool to take a degree course in Interior design. – However she travels back every weekend because she really misses us (Nothing to do with needing the money). Can you recognise us all ! The Tynedale Movember team took part in a Worldwide Moustache growing event raising over £200 for prostrate cancer – Winner to be announced. We will be replacing the main roof to the Tynedale completely during the first two weeks of January along with refurbishment to corridors too bedrooms 1 – 9 and aiming to refurbish a further 14 bedrooms during the year. Big roofing Jobs are what us hoteliers dread as its a major capital expense with nothing to show our customers unlike refurbishing bedrooms and public areas, still you won’t need your brollies indoors anymore ! !